examples involve sharp and potentially dangerous tools. This process should only be done while under Adult Supervision. 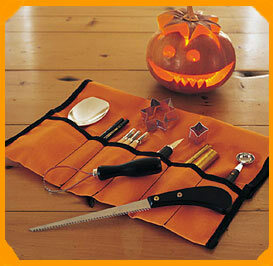 A Carving Saw is essential for carving fine, detailed areas, but can also be used for the entire Jack-O-Lantern. 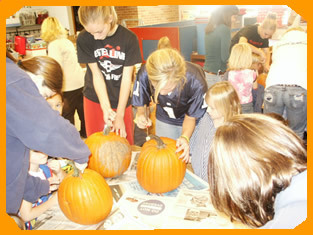 A transfer Tool is used to transfer your designs onto the face of the pumpkin. Carving Stencils can be drawn either freehand onto paper or use your computer to print your pattern. Prepare the pumpkin for carving, i.e. 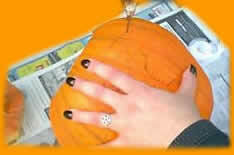 cut out the top hole and remove the seeds from the pumpkin. You can cut out around the top stem, but be careful not to cut in a circle or the top will fall through when you try to replace the lid after carving. Instead, cut hexagon or six-sided shape with the stem in the center. When cutting a lid, it helps to angle the blade of your knife or saw inward, so it creates a small lip for the lid to rest upon. Once you've gained access to the pumpkin, use a large scoop to remove the seeds and strings, then continue to scrape away on the inside of the pumpkin until the walls are no more than 1" thick. You can make more elaborate designs by scraping some areas thinner than other, or even away scraping away designs so that the light shines through strategic areas of the pumpkin wall, but be carefull, thin walled areas will begin to fail faster than the thicker sections. Select the paper stencil you want to use and trim the excess paper from it with the scissors. Be sure to leave at least a 1/2 inch border for the tape to go on. 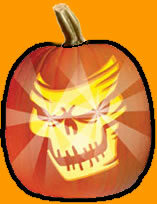 Attach the stencil to the face of the pumpkin with tape. Top first, then the bottom and lastly the sides. You may have to crease the stencil to tape the corners, if so, try to make the creases where the pattern will be the least distorted. Using the transfer Tool, press the pointed tip into and through the design lines on the paper stencil spaced about a 1/8 of an inch apart. Complex and thin designs might require the dots to be a little closer together. Check to see that all the lines have been transferred before removing the pattern. On large designs you can use the larger poker and place the dots farther apart, but for detailed designs, use the small poker and place the dots close together. The tip of the transfer Tool should be pushed in just enough to go through the paper and the outer skin of the pumpkin, not all the way through the pumpkin. It's important that you take your time when transferring the pattern from the stencil. Remember, you're making guide lines for sawing. Before removing the stencil, look it over carefully to make sure that all the lines have been transferred clearly. Once the paper stencil is removed you'll see the outline of the stencils pattern marked on the face of the pumpkin via little dots. Once you remove the stencil be sure to save it in case you need to refer to it while carving. Using the Carving Saw, push the tip of the saw-blade into a pattern hole and saw through the design lines with short back-and-forth motions. Basically, you're playing "connect the dots". It's important to remember that these are "saws", not knives. The saw is not used in the same way as a knife. You never cut with it, you saw with it. Take your time and follow the pattern edges carefully.Always align the saw blade to make the cuts straight into the pumpkin. When making sharp corners, remove the saw and re-insert it at the new angle. To make removal of the pieces easier you can cut them into smaller section while still in the pumpkin. Then carefully push out all of the cut pieces with your finger or a new pencil. To create the smell of Halloween with your Jack O'Lantern. Just sprinkle a little cinnamon, nutmeg, and pumpkin spice on the bottom of the pumpkin lid. Once the pumpkin is lit (with a candle), it will create a wonderful seasonal scent.